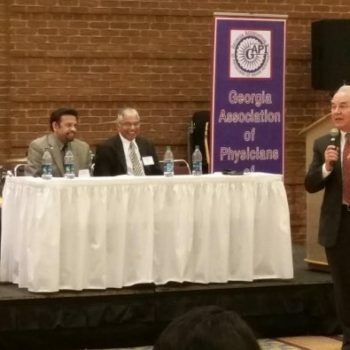 Atlanta, GA: Georgia Association of Physicians of Indian Heritage (GAPI) held its Atlanta regional meeting on December 13th at the Impact Hall in Global Mall, which was well received by more than 100 attendees. The occasion was graced by the chief guest R. Srinivasan,India’s Commercial and Political Affairs Consul for the Southeast USA, Dr. Manoj Shah, President of Medical Association Georgia (MAG), and many other notable community healthcare leaders. The meeting agenda was unique with a wide range of topical topics from education, philanthropy, entrepreneurship to financial management. GAPI board meeting was presided by GAPI President Dr Indran Indrakrishnan and attended by past presidents, Board of trustees & Board of directors which included Drs Manoj Shah, Yogesh Joshi, Arvind Gupta, Sudha Tata, PB Rao, Dilip Patel, Sudhakar Jonnagalada & Tarun Gosh. Dr Joshi presented a proposal on the management of Endowment Trust Fund for trustees’ consideration. Membership drive & planning of the annual convention for 2015 were also discussed in detail. A Membership drive committee chaired by Dr Sudha Tata consisting of board of Directors was proposed & approved. Dr. Indran Indrakrishnan, President of GAPI, in his welcome speech congratulated Dr. Manoj Shah for becoming the first president of Indian Origin of Medical Association of Georgia. 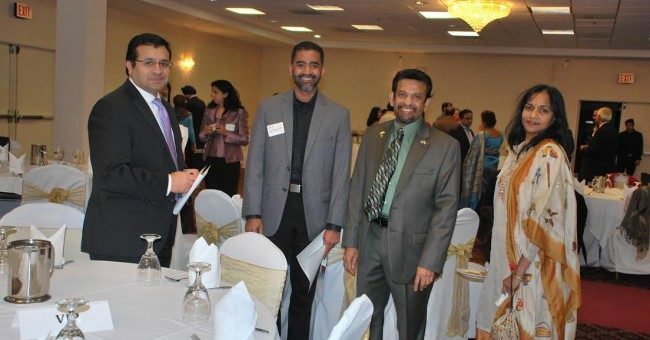 He further apprised the audience of GAPI’s educational, philanthropic, humanitarian, political, entertaining and social activities in the last eight months in Atlanta and other regions of Georgia. A beautiful & illustrative slide show was presented on GAPI’s past events, including the health fair inaugurated by Governor Nathan Deal, Augusta Regional meeting, participation at the Indian Health minister Hon. Harsh Vardhan’s reception, attendance at Indian Prime minister Mr. Narendra Modhi’s NY reception, Diwali function at BAPS temple with the chief guest Senator Mike Dugan, Beauty and the Beast musical dance drama production –fund raising event – graced by the chief Guest Senator David Shafer, and GAPI leadership at the Indian Ambassador for USA & Hon. S. Jaishankar’s Atlanta reception. He briefed the members about more regional meetings in the upcoming months next year in the various regions of Georgia with annual convention being in April 2015. Chief guest R. Srinivasan spoke about the current status of the Indian healthcare industry, which has registered a double-digit growth in the last few years, the trends, and the available areas of opportunity for investments in India. He highlighted on medical tourism, cost comparisons, success rate of surgeries and the professional competence of the healthcare industry in India. He assured the availability of his good offices and the Consulate for facilitation of investments in India. Dr Manoj Shah, the current MAG President & a past GAPI president, began his keynote address by thanking GAPI president Dr. Indrakrishnan for his strategic leadership in transforming GAPI to a more active & vibrant organization with community leaders participation. He informed the audience that, 7200 members strong, MAG is a leading advocacy organization that will prioritize its work on physician autonomy, transparency in the healthcare insurance, and medical malpractice tort reform and increase the healthcare access in underserved areas..
Emory University School of medicine star physicians Drs. Jay Varkey and Aneesh Mehta gave an elaborate lecture about their experience in care of four patients with Ebola Virus Disease (EVD) at Emory University Hospital. Dr. Jay Varkey, the first physician to care for a patient with Ebola in the US, started the presentation with an overview of Ebola and a summary of the clinical management of these patients. Dr. Aneesh Mehta continued the discussion by explaining the protocols put in place to protect the patients, staff, the public with high-level containment and monitoring methods, and how these were taught and communicated. This very educational and entertaining presentation was followed by a humanitarian work-related talk by Dr. Deepa Ranganathan, a chief mentor & board member of MD Junior, a student run 501(c)3 non-profit whose mission is to “Inspire Selfless Service through Mentorship”. MD Junior, founded by a ninth grader Shaun Verma, has expanded to 31 Chapters across the World, impacting several thousands. Recognized by the White House, Jefferson Awards and several others, the Organization brings together passionate Healthcare Professionals and students who have a strong desire to reach their full potential, by establishing Chapters in different schools and colleges, for Local and Global initiatives. MD Junior’s Global Medical Mentor Mission toHondurashas been described as a “Life Changing Experience.” Dr. Deepa Ranganathan emphasized that students, parents, healthcare professionals and educators with the desire to selflessly serve can join and be a part of MD Junior and give back to the community. Vijay Patel from Merrill Lynch gave brief presentation on retirement planning for physicians. He spoke about year-end planning and maximizing savings for retirement. He discussed using “after-tax” savings in a 401k to save more into the 401k. In addition, he spoke about using non-deductable IRA for additional retirement savings. As many people make yearend donations to charities, he went into the advantage and disadvantage of making donation directly out of an IRA and using donor advised funds. As part of the continuing philanthropic activities related to health care, GAPI Board of trustees recently voted unanimously to donate money Lydia House, a nonprofit organization in Augusta caring for women with cancer and BAPS Health fair of Swami Narayan Temple in Lilburn,GA.As the concluding event of this regional meeting, Dr Bipin Chudgar, the founder of Lydia House received the check for $4000.00 and Sanjay Pandya and Jayanthibhai Patel received the check for $4000.00 behalf of BAPS Health fair. Drs Sreeni Gangasani & Yogesh Joshi presented the checks on behalf of GAPI board of trustees. Dr Naresh Parikh, past GAPI president & present AAPI treasure, in his speech complimented Dr Indrakrishnan for his hard work and dedication since he became president early this year. He thanked Dr Indrakrishnan for elevating GAPI’s esteem and status to a much higher status than it was before. Dr Parikh briefed the attendees about the concerted efforts to confirm the nomination of Dr Vivek Murthy as the first US Surgeon General of Indian origin. Dr Indrakrishnan thanked the Chief Guest, speakers, volunteers, sponsors & all the attendees for making the 2014 Atlanta Regional meeting a successful & memorable one. The meeting ended with sumptuous dinner catered by Ashiana Restaurant.